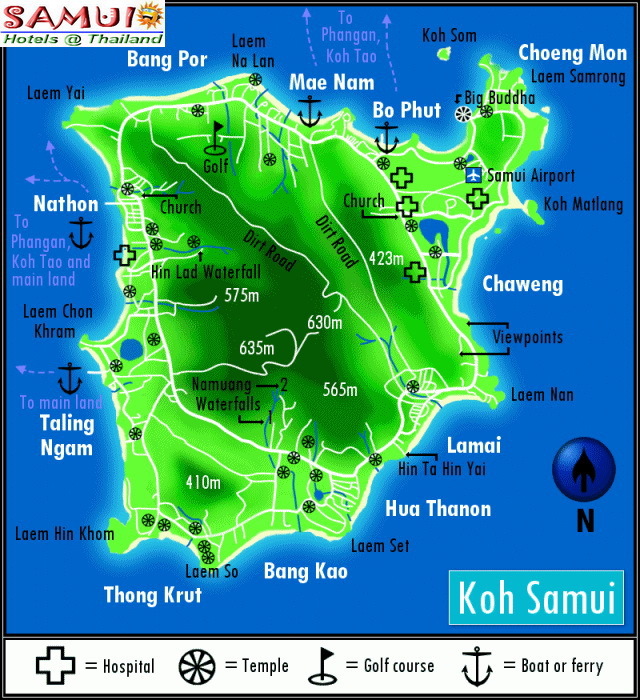 Bo Phut Beach, is really two places: Bophut beach, which sweeps down several kilometres between Big Buddha and Maenam beaches and perhaps one of the oldest places on the island, the charming Fisherman's Village, which takes up the middle section of the beach. Fisherman's Village is fast gaining a reputation that stretches way beyond Samui for being the most elegant and well-preserved place on the island. Lined by old wooden Chinese shop-houses, interspaced with a few modern buildings that match the tone, it retains a distinctly Mediterranean feel. This has probably got a lot to do with the fact that it was the main French outpost on the island for many years. Bophut is a very good compromise for those who want plenty of entertainment and yet plenty of peace and quite. During the day one can rent small yachts, jet skis, snorkelling gear, kayaks and a host of other water recreational items to ensure you have plenty to do all day, if you want to do anything at all other than simply bask in the sun on the beach sipping a fresh tropical fruit drink or pure coconut juice straight from the shell. Hillside Village Resort has only 12 uniquely designed deluxe villas offering exclusive and affordable accommodation. Bungalows direct at the beach. Cocooning is a full service offering all comfort and convenience for a memorable Koh Samui Holiday. With only 6 Thai Style Rooms. Fan and A/C bungalows direct at the beach. You always dreamed with his luxurious rooms. special individual atmosphere and elevated standard, rooms are nicely decorated in typical Chinese red color considered to bring luck and prosperity. Our prime, beachfront location in the quaint Fisherman's Village of Bo Phut features a panoramic view of the sea and Phang Ngan Island in the distance. Indulge yourself in the comforts of our bungalows, built to capture the essence of Thai architecture and the carefree lifestyle of Thai Villages. offer 2 big suites, 9 family and 27 deluxe rooms. Our facilities include air-condition and cable TV as well as mini bar and large bathrooms. offer one and two bedrooms houses with either pantry or European style kitchen, all have cable TV and a fried. Offers a choice of luxury beachfront apartments and provides luxury sailing & speedboat charters as well as daily entertainment for guests. 72 fan and air conditioned bungalows. 25 superior rooms that are built in the wooden style with view of the beach and garden. Hacienda with it's 8 Rooms, it's swimming pool accommodates you pleasure. Our new, small, family-run hotel located directly on the beach and enjoying an important location in the Fisherman's Village. Tranquil Beaches, traditional southern Thai architecture and a seductive destination spa with signature Anantara spa treatments. Location: Bophut Beach, We have 3 different villa styles, built in Thai oriental yet modern style with one or two bedrooms, a living room with flat screen TV. Our resort accommodation is elegantly styled with luxurious furnishings, so you will feel perfectly at home during your stay.